If you like Pina Coladas…you’ll love this Disney inspired Moana Pina Colada Freak Shake! A delicious tropical shake topped with Moana inspired treats. Hi friends! This week we’re sharing some fun Moana themed treats to celebrated the Digital HD release and because, well we just love the movie and are having fun watching it on repeat at home. Yesterday we shared a delicious Moana Coconut Cereal Treats recipe and you may just see those cute and tasty treats featured in today’s Moana Pina Colada Freak Shake! Have you heard about the Freak Shake trend? It’s basically a milkshake on steroids, a tasty shake topped with amazing, crazy and fun treats – anything you can think of! 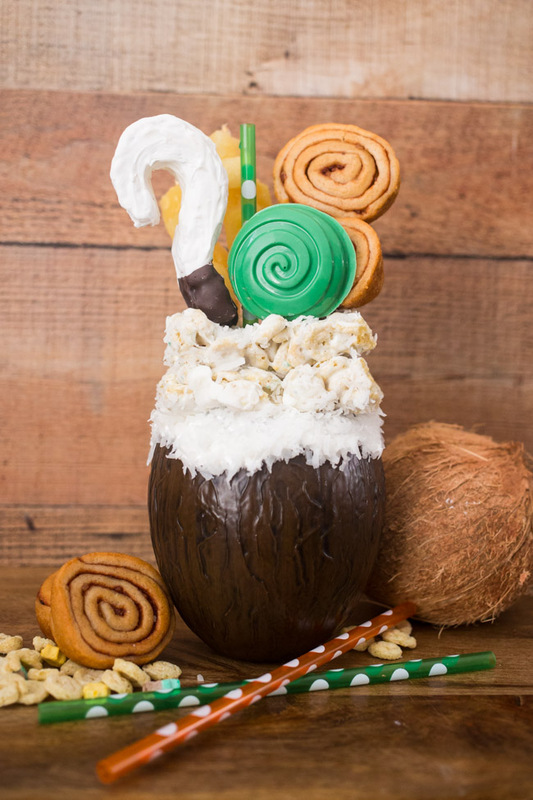 When we were thinking up a Moana shake, of course we first and foremost “considered the coconut.” Since it was such a huge theme of the movie, we knew it had to be a main theme of our freak shake. So we snagged the adorable coconut cup we just got on our Disney Social Media Moms Celebration visit to Disney’s Castaway Cay. 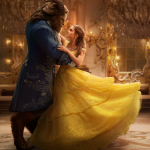 Isn’t it perfect? Now what to fill it with? A pina colada milkshake of course. Now I have to admit that you could just make this pina colada milkshake and call it a day – it’s THAT good. Add to class and enjoy! Moana Coconut Cereal Treats: First, we covered the top rim of the coconut cup in marshmallow fluff and dipped it in sweetened coconut shreds. Then we anchored the rest of the freak shake additions with a couple of our delicious Moana Coconut Cereal Treats. You’ll want to poke a hole through the stacked cereal treats where you can stick your straw. Maui Fish Hook: This cute fish hook addition is made from rice crispy treats and candy melts! We simply cut out the shape of the fish hook from a store-bought rice crispy treat and coated it in melted white and chocolate candy melts. Isn’t it adorable? Classic Moana. 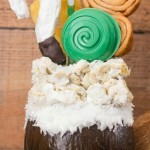 Heart of Te Fiti: It couldn’t be a Moana Milkshake without the Heart of Te Fiti, right? We filled a fun shaped chocolate candy mold with melted green candy melts. 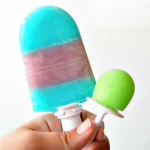 Once chilled and solid, we popped this cute little candy right on top. Pecan Spinwheels: Inspired by the designs on the boats in Moana, we added a couple store-bought Pecan Spinwheels on a skewer to the freak shake. Pineapple Skewers: Last but not least, we popped a couple of pineapple skewers on top to fill out our freak shake. And there you have it, one delicious and FUN Moana Pina Colada Freak Shake! 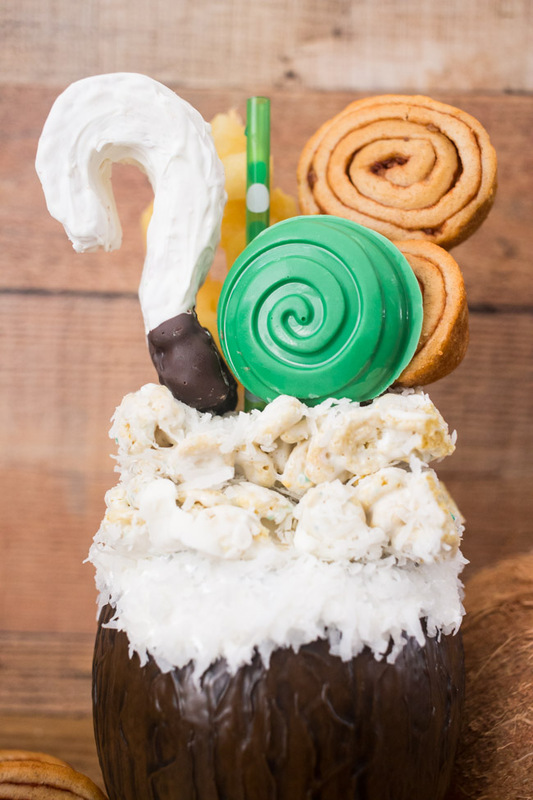 We had so much fun creating this Disney inspired Freak Shake, but wait, there’s MORE! 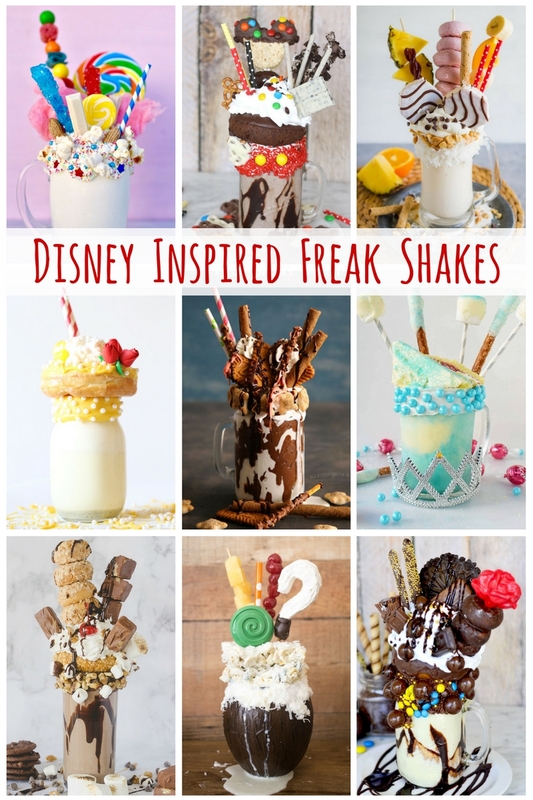 We teamed up with a few of our Disney-loving blogging buds who created more Disney Freak Shakes! Take a look below and click around for more freak shake inspiration! 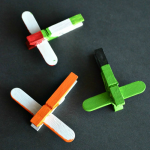 These are so fun! 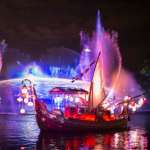 We need to get our hands on Moana asap!